Just posted a new tutorial on my blog, [URL="http://joysutton.com"]Joy Sutton Props[/URL], and I wanted to share it here as well. Today I want to show off a little technique I've been using for one of my commissions. The client has asked me to create a set of Megaman Starforce armor that is lightweight and flexible. I racked my brain a great deal on this, and had a lot of trial and error in developing this technique, but I feel I now have it to the point I can share the method. Lots of folks in the costuming community make use of EVA foam (foamies, craft foam, yoga mats, ect. Proper name Ethylene-Vinyl Acetate foam) to make armor, props, jewelry and all sorts of bits for their costumes. 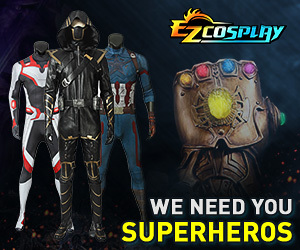 I've seen everything from angel wings to N7 armor to LOTR armor made from the stuff. It's economical, easy to cut, heat formable and very lightweight. However, I've found that it's a real pain to paint, and the finish will never really be smooth enough to pass for high gloss plastic or metal (though careful weathering can help trick the eye in the case of metal). Vinyl fabric is very durable, resists just about anything you throw at it (only second to wig fiber in chemical resistance in the costuming world) and comes in a decent variety of colors nowadays. I get mine from primarily spandex vendors, so the fabric itself is 2 or 4 way stretch spandex with a thin, flexible layer of pvc. There are even passable gold and silver pvc spandex fabrics available; I have used both, silver in Ed's Automail, and Gold for a few recent comic commissions, work fine for non-weathered metallics. I personally get my fabrics from [url=http://spandexworld.com/]Spandex World[/url] (free swatches!) but friends also swear by [url=http://www.spandexhouse.com/index.php?nId=1]Spandex House[/url]. I should also note that this method will work with any stretch fabric coating on the foam, so don't be afraid to try it with other types of spandex and knits. So, without further ado, on to how this is done. First, you'll need to cut your EVA foam into the shapes you'll need. In this tutorial, I am constructing the backpack for my client's Megaman costume. Once you have your foam pieces cut out, take the time to make sure they fit properly, as this is the last time you'll want to cut the base forms at all. They need to be exactly what you need before applying the fabric. Once you have your foam pieces, lay them out onto the back side of your fabric, with the foam piece's back side facing you. Now, cut out your fabric with some extra to work with on the outside. I usually leave anywhere from 1/4 to 1/2 an inch extra when I work with 3mm foam, for thicker foam, leave more fabric. Next, cover your workspace with something you don't care too much about. If you are working on a wooden table with varnish, cover it up! The contact cement's fumes will melt varnish (trust me, I now have a bit on our dining table to resurface). Now, you'll want a bit of scrap card or paper to put under your tube of contact cement (this stuff is messy coming out) and your cotton swabs to apply it with.I also recommend keeping a very clean workspace here, this stuff has the potential to get messy. Now, the piece needs to have 3-5 minutes to set up. Contact cement will stick if you just put the two surfaces together immediately, but not very well. You leave the cement exposed to air until it becomes just tacky, then you can press the surfaces together and get a very tough bond. If you have a tight curve or sharp angle, now is the time to cut some slits in the fabric to allow proper give. I find you really only need them on inner curves and angles, but here are a few for demonstration purposes. Cut to within a hair of the foam edge. Now, once notches are in where necessary, and the cement is tacky, you can fold the edge of the fabric up to touch the cut edge of the foam. The bond will be instant, so be careful as you go. I find the best way to do this is hold the foam down with one hand, and slide your finger underneath the fabric edge, pressing against the foam through the fabric. Try to not stretch the fabric as you do this as well, or the final piece may end up with wrinkles. After you bond the edges, give them a few more minutes to fully set up before dealing with the excess fabric. Use a nice, sharp set of scissors for the best results. You'll want to angle your scissors so that one blade is resting on top of the back of the foam, parallel. Trim off the excess fabric, getting as close to the foam as possible without shearing bits of it off. Now flip over your piece, and check that the front is nice and smooth. Bendy! This stuff can be bent, twisted and crushed to a reasonable degree and will return to its form easily while still staying shiny and smooth. Now, repeat this process for all of your pieces and assemble as you see fit. I personally like building an inner structure out of more foam to attach the pieces to. You -can- bond the surface of the vinyl to the eva foam backing of your pieces, but it is not as strong as bonding foam to backing fabric or foam to foam. To bond the foam to foam, you can use contact cement again, or, since it won't show anyways, hot glue. I don't prefer hot glue in places where it might seep out or warp materials, but in places no one will see anyways, well, it's certainly quicker than the cement.Here you can see the support structure I made for the backpack and all of the associated pieces I have skinned in vinyl. Admittedly, black EVA foam may not have been the best for a photo tutorial. And here we have all of the pieces assembled together. Weighs about 3 ounces! Hopefully this will be helpful to folks wanting an inexpensive and flexible option for high gloss armors. Did you know if it was possible to paint the vinyl? I was considering this for my Samus Aran costume but I couldn't find the right color for her bronze armor. I haven't tested too extensively for paint, but everything I have seen, probably not. This stuff is really resistant to any sort of adhesion. I did see a metallic spandex in a fairly close color though: [url]http://www.spandexhouse.com/search-result.php?pline=&searchKye=Meta-175[/url] Wouldn't be as smooth, but might be passable. Maybe I'll try some paint experiments with my numerous vinyl scraps. She did the same vinyl over foam technique for both of her costumes. You can actually see the progress of her suit on her website. But it's a really cool technique and definitely looks like shiny armor! Wow, super cool technique! Thanks for sharing, I'll keep this in mind for future cosplays! great idea, how many mm foam you used? 3? or 5? I used 3mm, since that was what was most readily available where I live. Any thickness would work though. Oh my god I love this. Imagine Iron man cosplay with this? Would be so bangin'. BTW, did you heat mold the final vinyl-backed pieces to make the finished piece? That's quite a nice curve you got there. I wasn't entirely sure if that curve was there from the get-go due to the way the pieces were cut. Most IronMan suits (Stark himself, not Warmachine) are typically very thin. I would look up StealthCosplay on youtube. He does a lot of IronMan stuff with EVA foam and uses 3mm thickness.